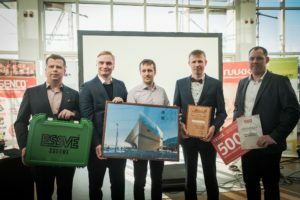 Contest “Prefab House of the Year” is organized by Estonian Woodhouse Association and Estonian Wooden Houses Cluster since 2010 and was held for the ninth time in 2019. 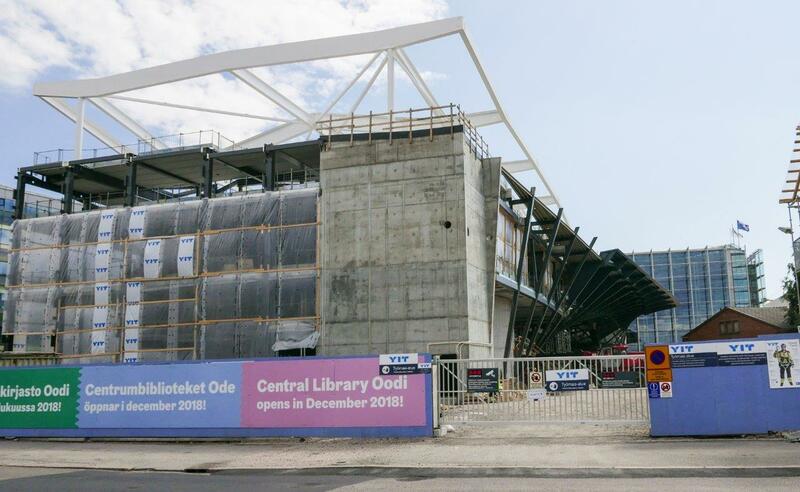 The construction of the Helsinki central library began on 01 September 2015. For Timbeco, the design and construction phase lasted 2 years. 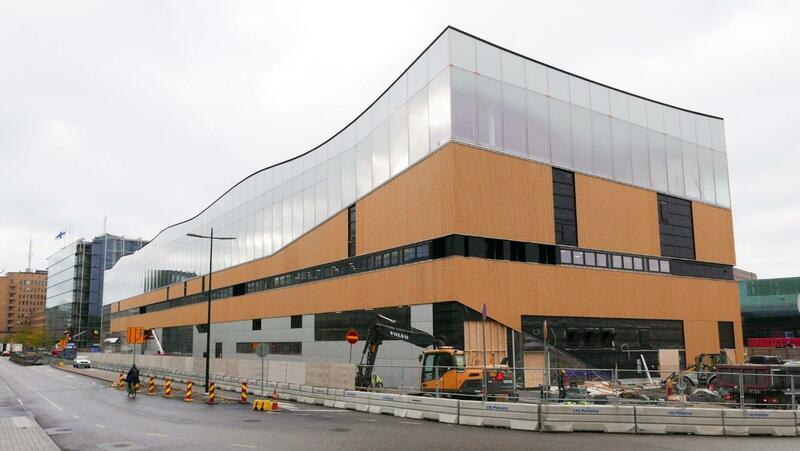 Our task was to design, manufacture and install the roof and facade elements of the Helsinki central library building. A major opening party took place in December 2018 on the eve of the celebration of the 101st anniversary of the independence of Finland. The completed building has three floors, all with different functions. The first floor has a cinema, a cafe-restaurant and various multi functional halls. On the second floor there are music and video studios and workshops for craftsmen. 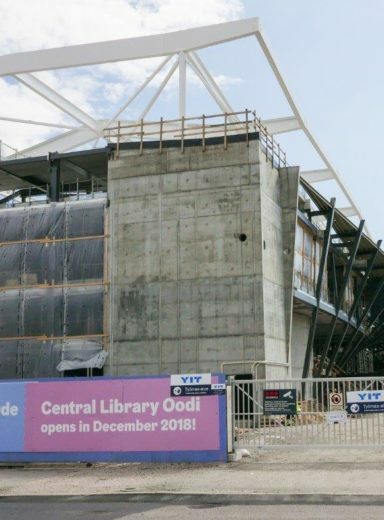 The third floor is for the library, with more than 100,000 books. A large outdoor terrace is also open for guests. Building type: A hybrid building with a metal and concrete structure, with wooden elements covering the roof and the facade. 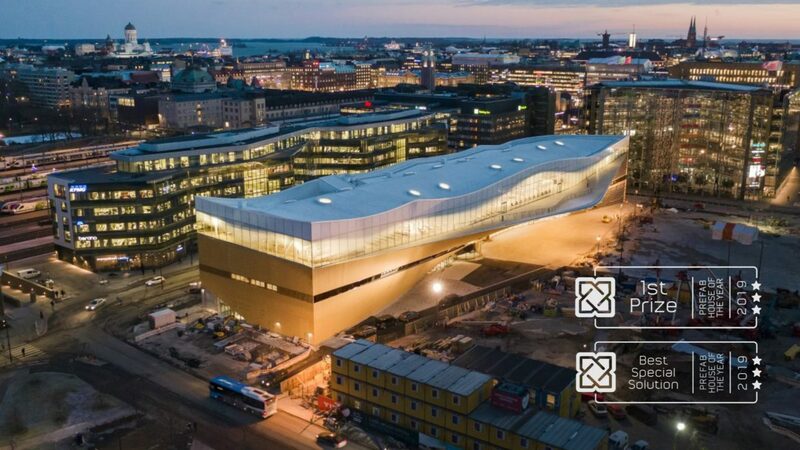 Helsinki central library source information was BIM model, ARK and RAK assemblies, descriptions of building constructions, and partially the design of wooden elements. 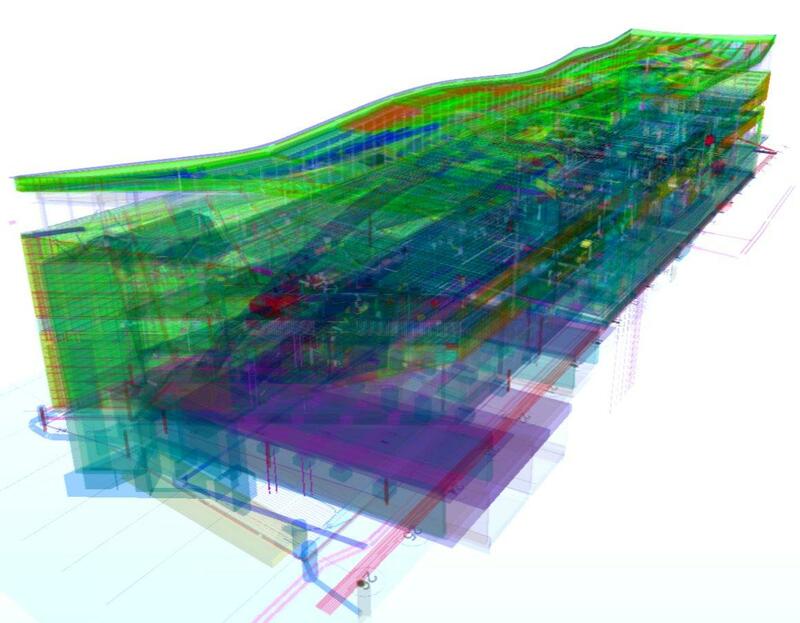 The main project information came from the BIM model, which included layout of the whole building, metal and concrete structures and special parts. Timbeco’s designers used the BIM model for concrete and steel, on the basis of which all the wooden elements were designed one by one. None of the wooden elements was repeated. The main challenge for the design team was ever-changing background information. 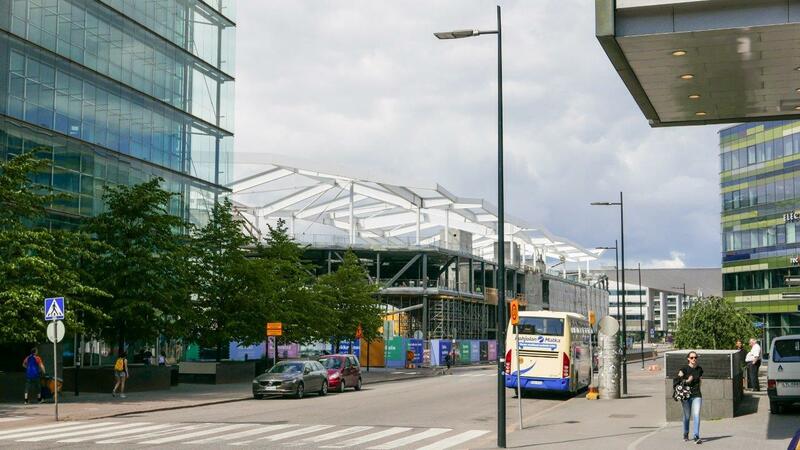 Since the concrete and steel structures were designed at the same time, the information on which the wooden roof and facade elements were based was obsolete and has steadily changed throughout the life cycle of the project. As the building evolved, it was necessary to make significant changes to the source information. 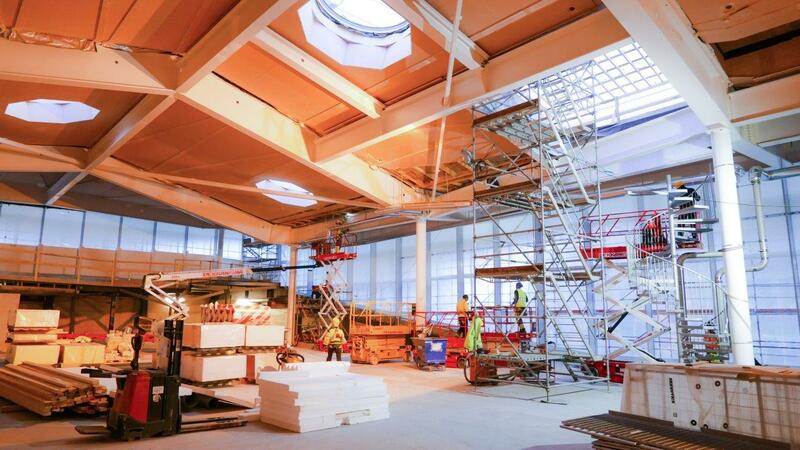 LVL (laminated veneer lumber) beams of 12 m long roof elements needed cuts from a wide range of angles. No timber processing service was provided by anyone in northern Europe, and therefore all elements had to be designed to fit into the Hundegger PBA for processing. 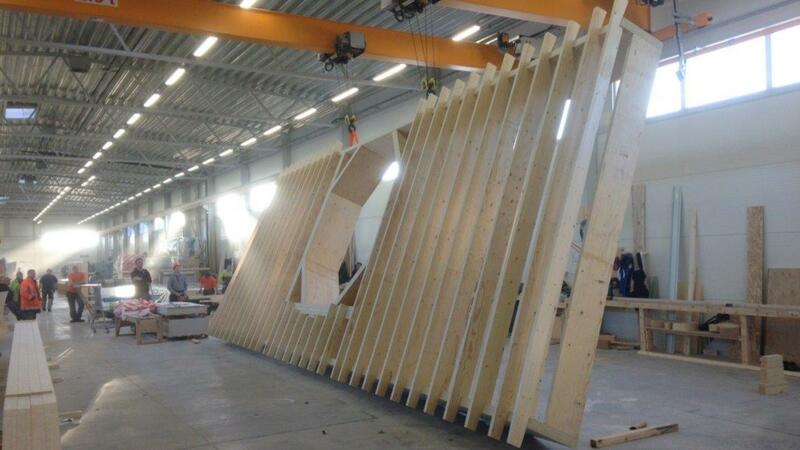 There was no suitable software for this operation, and Timbeco, in cooperation with the BIM software company HSB Cad team, had to find a solution and optimize the CNC device software according to the project. Some elements needed to be designed twisted and the underlying construction had inaccuracies compared to the original BIM model. Because the building was very special and with simple measurements, it was not possible to find out the problem. Compared to the results of the 3D scanning, there were not very large deviations, but small variations were sufficient for the incline in the opposite direction. Each completed item was suitable for installation only in a location specified in the project. The production of sample items is common for such large projects. The Timbeco factory produced a single roof element and one facade element with a large 12m (Skylight roof window). At the time of the client’s visit to the Timbeco factory, we raised the facade element to a height close to the actual wall height of the object. It helped to see the real result achieved on the object. 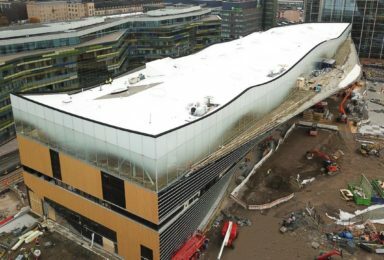 Helsinki Central library roof kit consisted of various shapes (triangular and rectangular) with roofing elements (up to 1m in diameter), which were equipped with insulation materials at the factory. On the inside of the roof element was a fireproof gypsum board and the outer layer was covered with bituminous coating. 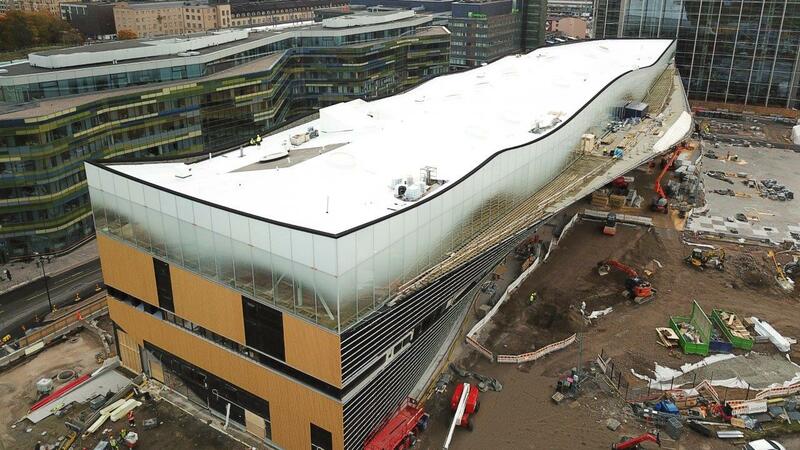 The largest roof element was 4.3m x 12m, with a mass of 9000kg (Skylight roof window elements). The weight of one LVL (laminated veneer lumber) beam was about 250kg. The largest element had a total of 12 pieces of LVL beams. The wall elements were insulated and covered with bitumen roof coating. 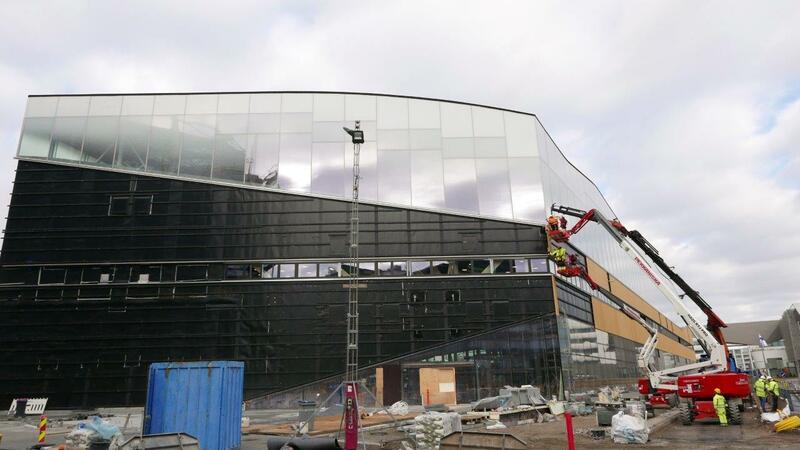 A specially designed facade cladding was installed on the site. Traditionally, all wooden elements are produced on a level surface. 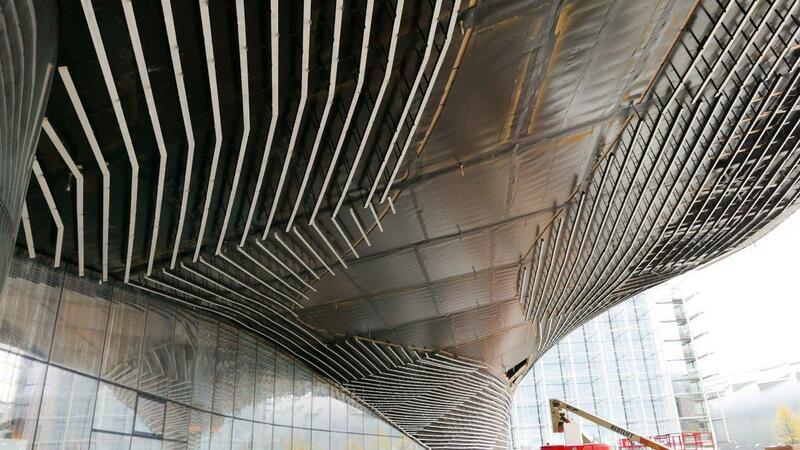 Thanks to the multi-dimensional metal substructure, many roof and wall elements had to be twisted. Such elements needed to be completed in conditions that required non-standard operating procedures and solutions from the production team. The biggest challenge for the production of roofing materials was the processing of a massive 12m LVL beams with CNC machines, because, due to its unprecedented dimensions, the processing of this material was a very complicated task. 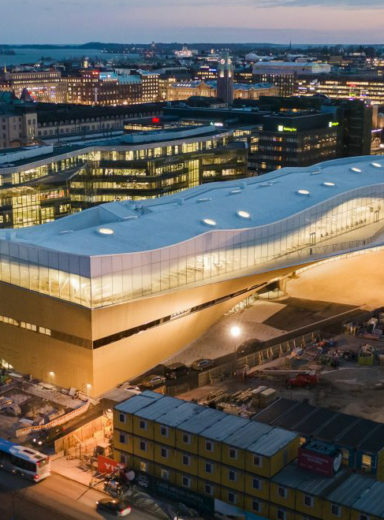 In the case of triangular shaped roof elements, the most complicated interconnection of massive beams inside the element was that it was not a rectangular solution and it was difficult to find measuring points. As the initial phase of the installation of roof elements revealed that the source information and the actual situation did not coincide, it was a very right decision to use 3D scanning. The greatest benefit from 3D scanning was the design of the roof elements and surface the western façade. Due to this we got almost all the elements produced and installed precision. 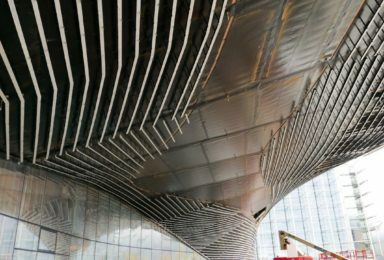 Without 3D scanning, a large part of the elements would have been inaccurate and, in this context, the whole further construction process would have been slowed down. As a rule, we used a 160t lifting crane to install the roofing elements. At times, we just had to build a crane with a lift of 400t to raise 5 elements. 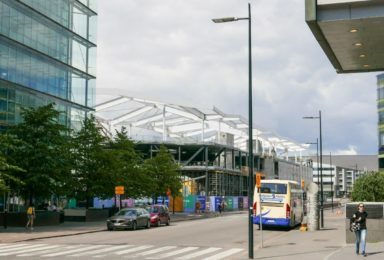 The need for a high lifting crane was due to the fact that the roof elements could only be raised on the one side of the building. 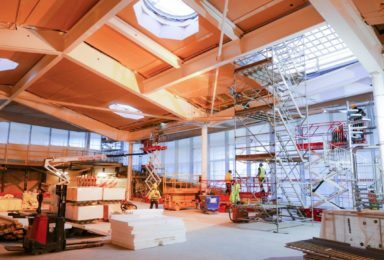 The fastening of the elements to the load-bearing structure was carried out from the bottom and was complicated as the work was carried out on elevators below. The winds were also 25m above the sea level, much stronger than on the ground, and the building was also located on the “wind corridor”. For the installation of a western wall we used a lift truck. 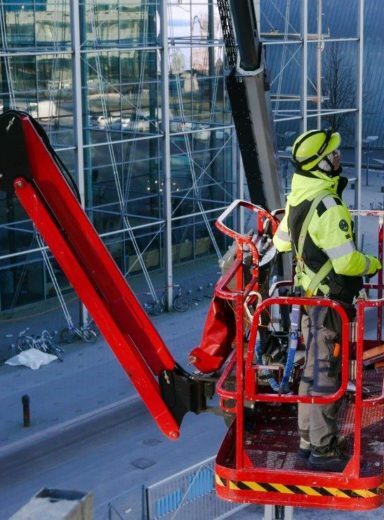 In addition, we have been able to make a special movable clamp to lift the elements from the ground. Despite the good facilities, the installation of wall elements was a great deal. It was not possible to move the machine gradually by raising the arrow by 15m. 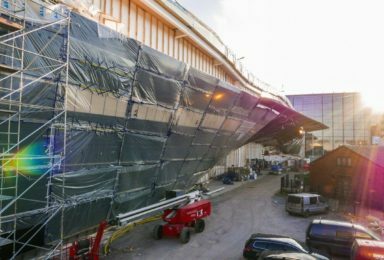 When the cabin moved a few millimeters on the ground, at 15 meters, the changes were comparable to several centimeters. The Helsinki Central Library project was Timbeco’s largest and, to date, the most complex project in Timbeco’s 25-year history. The work and cooperation of the dedicated project team with the main contractor was challenging, but all Timbeco’s work was completed by the deadlines and the whole project was a success for us. Our team’s expertise has greatly improved through this project and has given us a great deal of self-confidence to carry out large and complex projects in the future. Based on the Helsinki Central Library project, we recommend all manufacturers of prefab wood products – in order to achieve good results in installing elements for hybrid structures, it is wise to use 3D scanning of the object. The resulting dot cloud provides a more detailed overview and comparison model, thus reducing the risk of errors significantly. 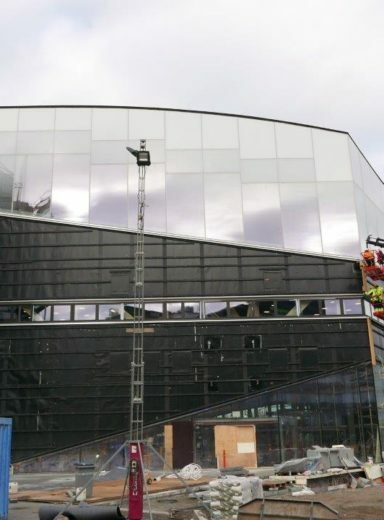 The construction of such large buildings is always a major challenge for the construction site logistics, cooperation with other contractors and, of course, weather. 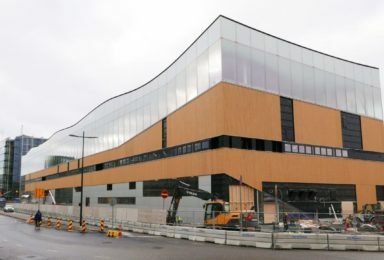 The storage of wood furniture at the Helsinki Central Library’s construction site was extremely complex, and the entire logistics were thrown to the last detail. The work was due to be completed in a timely manner, as the working face had to be surrendered at all times. 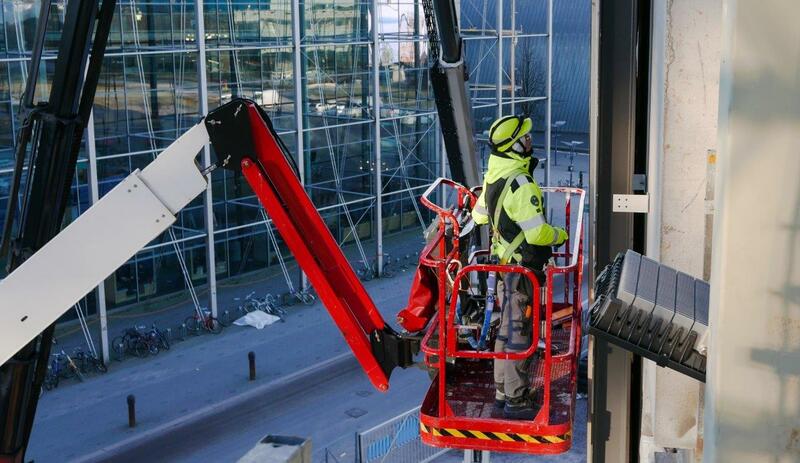 Often, it was necessary to move the crane or lifting equipment at inappropriate times in order to allow the loading of various building materials, the storage at the site and the smooth progress of other stages of work. 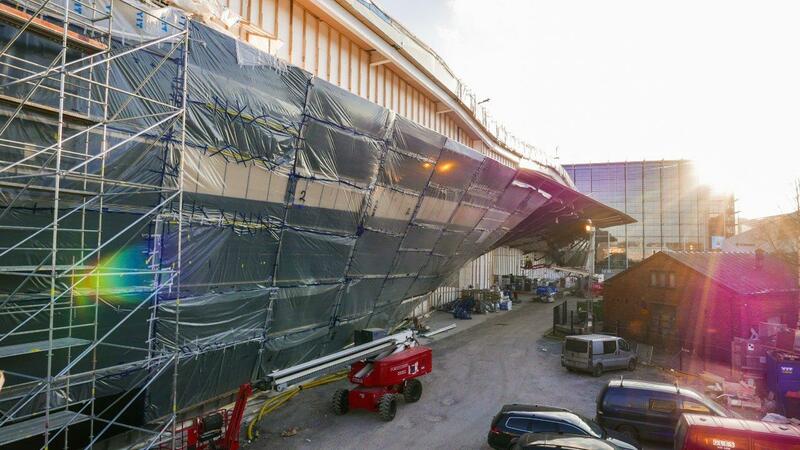 Cooperation with the main contractor is very important for such large objects. 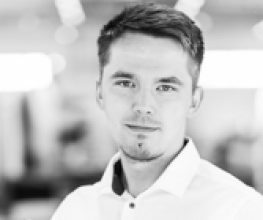 We got a lot of important lessons and we have to thank Timbeco’s project manager Timo Urva, designer Karel Koitla, site manager Verner Nõmmsal and sales manager Indrek Tiits.